It has to be GripClad's HEAVY DUTY anti-slip Stair Tread Covers. The Rail Industry has been using our product for many years, to ensure the safety and comfort of their passengers, even in high traffic areas. Our products are both reliable and hard wearing, making them ideal for busy public places. 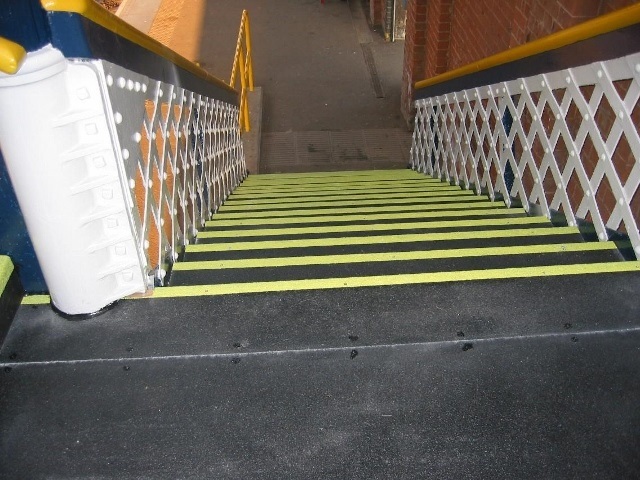 Various contractors acting on behalf of Network Rail, chose GripClad's range of anti-slip products to safeguard and eradicate the problem of slippery footbridges and platform stairwells throughout the rail network. Must keep the passengers safe. Rail passengers were suffering from slippery footbridges and dangerous stair areas high traffic platform locations in a number of railway stations. In order to provide them with safe travel experience, Network Rail needed a heavy duty anti-slip solution that could stand up to the punishment of daily foot pounding and impact. Enter...GripClad. GripClad supplied the contractors with a retrofit product to ensure full safety over existing footbridges and stairwells. The product's success met all the specifications for an adequate slip-resistant surface because of the very high footfall of train passengers daily.